Millions of people live and work in areas where they cannot rely on the state to keep them safe. Instead, their security is provided by armed groups: for example, community or clan militias, warlords, rebel movements, drug cartels, or mafias – i.e. local strongmen that can defend their territory against intruders and keep order within it. But their deal with the population usually goes far beyond providing physical security. When armed groups protect property rights, facilitate trade, and offer fair dispute resolution, the local economy grows and with it the protectors’ tax base. As long as the interactions are long-term, the strongmen gain legitimacy and profit from developing a reputation for effective protection, good governance and non-punitive taxation. But how can business travellers, aid workers, researchers, reporters, and adventurous tourists take advantage of such local informal protection arrangements, given they are on short-term business? Why don’t local criminals (or the protectors themselves) take advantage by preying on (presumably well-off) foreign visitors? One interesting answer is kidnap insurance – or rather the security advice that is an integral part of insurance when visiting informally governed areas. It is in the financial interest of insurers to minimise the kidnap risks of their customers. Therefore, they use security consultancies to screen their customers’ travel plans and advise companies on how to keep their staff safe. To do so, the security consultancies constantly monitor which protectors are reliable, who is facing challenges, and who has turned rogue. 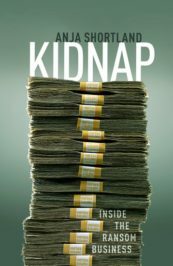 Kidnap insurance is surprisingly concentrated: almost all kidnap risks are insured or reinsured through special risks insurers represented in the famous insurance market at Lloyd’s of London. The insurers’ security consultants are part of a dense social and professional network and discreetly exchange information with each other. Thus, it becomes possible for informal protectors to develop a reputation for delivering effective protection that will be shared with the people intending to visit their territory. A modicum of law and order is a necessary precondition for travel, trade, and investment. Unless kidnap risks are kept low, insurers will not insure, and tourists, Western companies, and NGOs will stay away. If security consultants tell companies to evacuate their staff, they know they can no longer fulfil their duty of care and have to put their operations on ice. This drastically reduces local economic performance and hence the protectors’ income. A good reputation for keeping law and order is thus very valuable – both for host governments and informal governance providers within their territory. Although NGOs, companies, travellers, and researchers come and go, the Lloyd’s market creates repeated interactions: security consultancies advise many companies over long periods of time. Unlike government-provided travel warnings, which tend to advise against all “non-essential travel” for entire regions, commercial travel advice is extremely fine-grained and detailed. By recommending reliable hotels, taxi companies, tour operators, and private security companies, foreign demand for protection is channelled towards enterprises that keep their customers safe even in complex and hostile territories. The exact connections between the approved providers and the protectors usually remain opaque – what matters is reliability. Seeking cheaper alternatives is risky, and the insurance cover is invalidated if companies choose to ignore security advice. The recent spate of Islamist attacks on hotels and shopping areas popular with Western tourists across Africa can thus be explained as a rational economic strategy for insurgent groups to capture (or obtain a cut of) the protection payments. As rebel groups emerge or expand their territory, the effectiveness of local power-brokers may be compromised. Formerly reliable protectors who fight a territorial challenge may turn into predators to raise additional campaign funds. Security consultancies therefore constantly monitor shifts in the local power landscape and inform the insured when and how to modify their behaviour. When territorial disputes occur, the insured are redirected towards more effective protectors, or evacuated until the situation is settled. For example, in 2015 foreign mining companies received advice to no longer use the Radisson Hotel in Bamako, Mali – which was targeted by Islamist groups only weeks later. Warnings may highlight specific routes that should not be taken, foreigners may be advised to keep a low profile at certain times or avoid events or locations where trouble is expected. The reduced demand for local services creates a strong financial incentive for protectors to re-establish control – or come to some financial compromise with their challengers. Security advice thus facilitates business and travel in informally governed territory – even when governments advise travellers to avoid a region altogether. Channelling business towards reliable suppliers creates clear incentives to protect rather than prey on short-term visitors. The system only breaks down in times of outright territorial dispute: predation becomes optimal if it denies resources to the competition and swells your own coffers. Thus, if your company’s security advisory tells you to change your hotel or evacuate altogether, it is a good idea to take that advice. Feature Image Credit: ‘Coins Currency’ by Stevepb. Public domain via Pixabay. Dr Anja Shortland is a reader in political economy at King's College London. She has worked as an academic economist at Leicester and Brunel Universities, rising to fame for her work on the economics of Somali piracy. She now studies private governance in the world's trickiest markets: hostages, fine art, and antiquities- and how people live, trade, and invest in complex and hostile territories.